Newspaper companies have fallen farther and faster in the last six years than anyone could have imagined. Beginning with the third quarter of 2006, newspapers now have seen 22 consecutive quarters of declines in print ad revenues – a loss of 57 percent. And there’s no end in sight, as we’re seeing continued declines in 2012. Most analysts also see continued declines in the years beyond. The recession was a big part of this, but for most of the U.S. economy, it ended in the summer of 2009 – nearly three years ago – with a return to weak growth. Yet newspaper ad revenues continued to plunge at double-digit rates in 2009 and 2010, easing to single-digit declines in 2011 with few signs of relief in 2012. This is much more than a recession. What’s happening to the newspaper business, and why? This disaster may seem to be centered in the newspaper industry, but it’s much larger than that. In reality, this industry — along with the yellow pages business, which has suffered even more — is a canary in the mineshaft. They are the first to suffer the hard impacts of a massive and fundamental change in the global human information system. 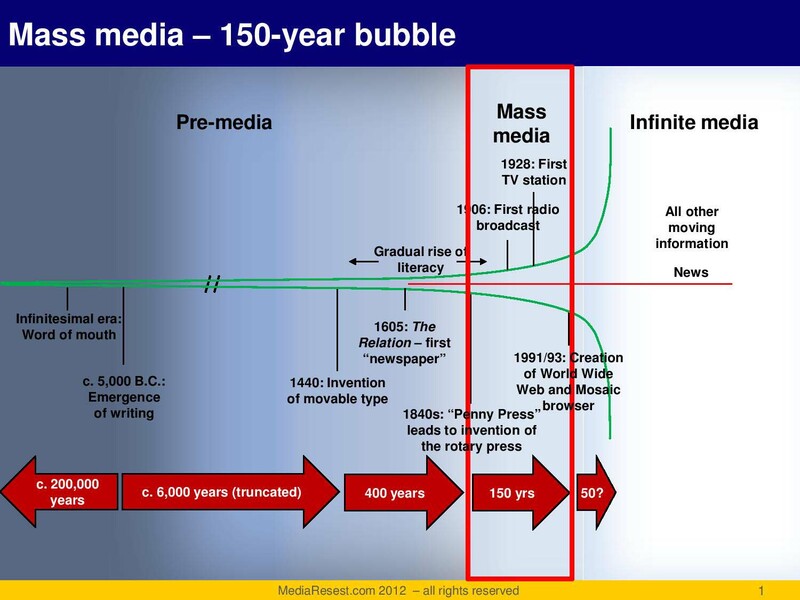 It’s the beginning of the end of the Mass Media Era — a brief, 150-year bubble in this history of human information systems. This change is a wonderful breakthrough for humanity — more on that in a later post. But it’s a disastrous development for the mass-media businesses. Mass media began with newspapers when, in the mid and late 19th century, advances in printing and paper technologies made it possible to print more and more copies per hour. The biggest newspapers grew from a few thousand copies a day in the early 1800s to hundreds of thousands at the start of the 20th century. Radio followed only a couple of decades after that, and television only a couple more decades later. Looking back now, it’s hard for us today to comprehend how short the mass media era was, and how different from all that came before it and will come after it. For most of homo sapiens’ roughly 200,000 years on earth, people lived with no information technologies at all. The information pipe — the sum total of all information moving through human systems — remained infinitesimally small. Writing arrived about 7,000 years ago, but it touched only a tiny slice of the population, so it barely expanded the pipeline. From hunter-gatherer days through the Renaissance, word of mouth was the only “information system” for most of humanity. Technically, the information revolution began around 1440, when Johannes Gutenberg developed a complete printing system using movable type and a hand-operated mechanical press. But it took almost 400 years for his system to improve to the point where it could produce quantities in mass, at prices the masses could afford. So, in reality, the beginning of the mass media era can be traced to 1850 or so, when the high-speed rotary press made it possible for almost everyone to buy a newspaper every day. And most people did. Similarly, when radio and television debuted, in the 1920s and late 1940s, respectively, it took only a couple of decades for each to reach 50 percent penetration in the United States. People were starved for news, information and entertainment, and they eagerly laid out their hard-earned cash to take advantage of these new media. The 150 years from the mid 19th century to the turn of the 21st century were only the blink of an eye in humanity’s 200,000-year history, but they constituted a profound turning point in human development. At the beginning, information was a scarce and precious commodity available only to an educated and wealthy few. At the end, information was a cheap and abundant commodity available to almost everyone. The mass media technologies — print and broadcast — created an incredibly lucrative (and, it turns out, temporary) business model. It’s the same model for all the mass media, even though they use different technologies. What makes the model powerful is the fact that it’s lopsided. At the origination end of the pipeline, very few suppliers — newspapers, radio stations and TV stations — provide limited amounts of information to very large audiences. The “mass” in “mass media” is only at the receiving end. 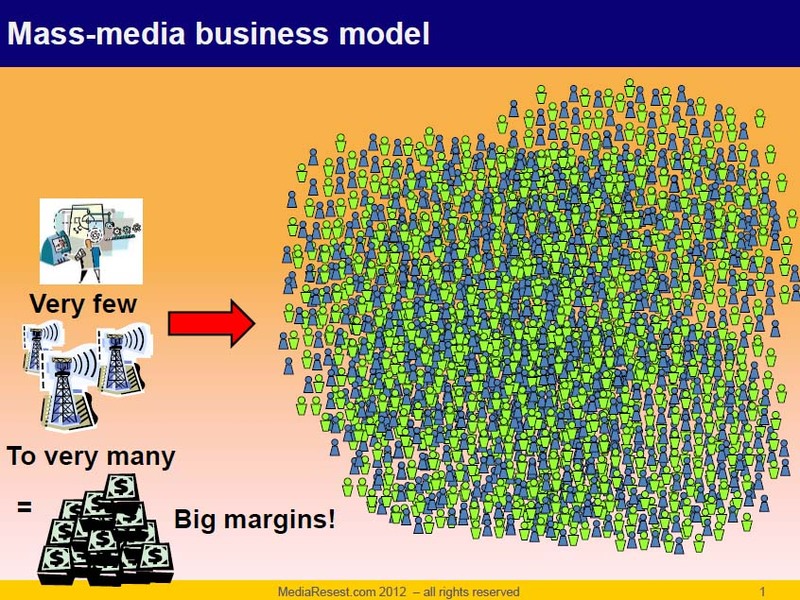 The Mass Media business model depended on few to many. Mass media providers are few because it’s difficult and costly to do what newspapers, radio stations and TV stations do, and broadcast bandwidth is limited by law. Every market has few providers. And the amount of information they can send remains small, because newspapers are delivered only once a day and because only so many words can be squeezed into 24 hours of broadcasting. The scarcity of providers and content is what made the business model work. From the beginning, mass media owners used information — mainly news in newspapers, mainly entertainment in radio and television programming — to attract audiences. The audiences were huge because people had few other choices for news and entertainment. These big audiences were the key to the revenue, mostly from advertising. Businesses need to reach consumer audiences, and in the mass media heyday, newspapers and broadcasters owned the only pipes that reached the masses. To reach the desired audiences, advertising had to flow through those pipes adjacent to news or entertainment content. That produced high ad volumes, high ad rates and handsome profit margins. The lopsided business model was a formula for great financial success. But it wasn’t a natural condition. It was a temporary state resulting from the limits of the era’s mechanical and electrical information systems. Those limits would not last forever. In the late 20th century, the end of those limits came on quickly in the form of digital information technologies, based on converting words, sound and images into electronic 1’s and 0’s. This technology began to reach the consumer marketplace in the late 1970s in the very earliest personal computers, followed by laser discs and CDs. Digital home computer connections followed in the late ’80s and early ’90s — the beginning of the commercial and public internet. For the last 20 years, digital technologies and devices have improved rapidly, costs have tumbled and access has spread. By 2004, the internet had achieved critical mass in the U.S., reaching more than half of all U.S. households. This fast and continuing progress is drastically lowering the cost of information at both the sending and receiving ends. As a direct result, the limitations and barriers that created the Mass Media Era are disappearing fast. The effects on newspaper and yellow pages companies have been incredibly harsh, and radio and television will follow the same path as digital bandwidths increase in the coming years. Posted on May 1, 2012, in Disruption, The basics. Bookmark the permalink. 10 Comments.